Are you looking for a center console that can take you anywhere? A boat that is practical for the family, but equipped for serious fishing? A boat that is nimble enough to navigate the flats, but robust enough to venture offshore? This boat does not exist…until now. Regulator Marine has just announced their latest innovation in the center console market – the 26XO. The 26 XO is the most recent addition to Regulator’s lineup of center consoles and is meant to be a crossover boat, capable of performing in bays, lakes and rivers, while also offering the stability to be taken offshore. This model was built to bridge the gap between traditional “deep-v” center consoles and popular “bay boat” styles. Regulator President and co-founder Joan Maxwell spoke to this point, saying, “There is not anything that we can really compare this to on the market”. The 26 will be the first of an entire XO series, with more models being planned for the future. When comparing the 26XO to its deep-v relatives, this boat looks remarkably similar, with distinct Regulator lines and finish; however, it is decisively different than any of its predecessors. 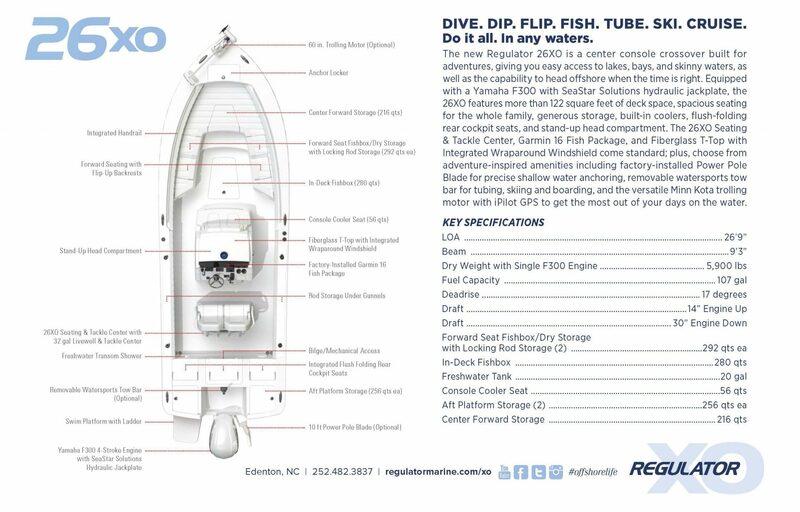 The 17-degree deadrise is much shallower than the 24-degree deadrise of the traditional models, which allows for versatility in different boating conditions. This versatility is furthered by its ability to perform in shallow water with a standard Yamaha 300 Outboard and a SeaStar Solutions hydraulic jackplate, providing a maximum draft of 30 inches and a minimum draft of just 14 inches. There is also an option for a Minn Kota trolling motor with iPilot GPS for those wishing to maneuver in the shallowest of waters. With all the added fishing features, this boat also hosts plenty of comforts for the entire family. The 26 has the signature Regulator forward seating with built-in backrests, dual helm chairs, plus three folding rear cockpit seats. In addition to seating, the 26 comes with a fiberglass t-top, wrap-around windshield and a stand-up cabin. There is ample storage for a day on the water with a console cooler seat, a 280 qt. in-deck fishbox, and large compartments both fore and aft. The Regulator 26XO made her official debut at the Miami International Boat Show, which opened February 14th, 2019. Regulator President, Joan Maxwell went live on Facebook at the Miami Show on Valentine’s Day to provide a through walk-through of this all-new model. The Bluewater Yacht Sales team is excited for the arrival of this model to our stock inventory. Please contact us for more information. 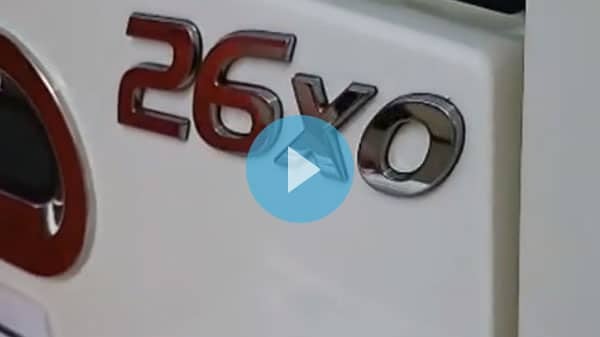 Will the 26 XO be offered with twins? Looks sharp and the write up sounds great. What are the performance stats and pricing?